Hand of Fate was quite the indie surprise when it launched in early 2015. The punishing Dungeons & Dragons inspired card game melded multiple genres and excited many geek fantasies. It pushed the boundaries of imagination, bringing a punishing tabletop adventure that reveled in telling stories and leaving the fate of the player in the hands of chance. Though its ingenuity impressed, it wasn’t without its fair share of technical hiccups that made the road traveled a little rough. Now that the sequel is out, not only have most of the rough edges been polished, but the formula has been touched up to tell better stories and more spectacularly test the player’s luck. 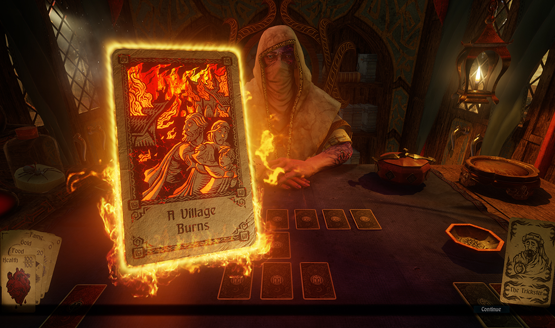 Told and played through the cards, Hand of Fate is an adventure that’s at the whim of the deck. Each card is an encounter, and it might be something as simple as seeing forest maiden and asking for assistance, or as difficult as getting ambushed by bandits on a rickety bridge. Combat is separate, done through the increasingly popular Arkham style of fighting, but health carries over between the combat encounters and the tabletop campaign. Many of the encounters are left to chance, and a randomized draw of the cards could result in resounding success or brutal failure. Fall to zero health in either, and your adventure will need a new beginning. Hand of Fate 2 dives deeper, cultivating the experience to be less random in many ways, while still making every single moment feel unique, exciting, and ultimate left in the hands of the fates. 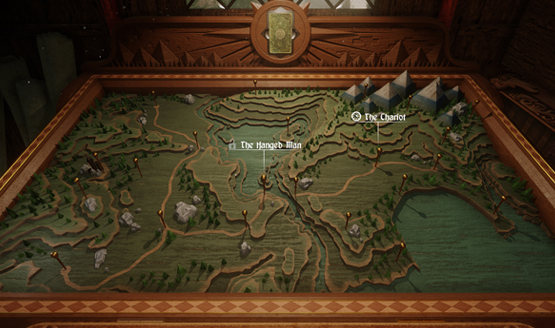 Broken up into 22 different campaigns, the stories being told in Hand of Fate 2 are much deeper than the rather disconnected scenarios of the first game. There are still the random cards that bring up unique scenarios, but each individual campaign has a specific purpose and direction, complete with its own set of encounter cards in the mix. 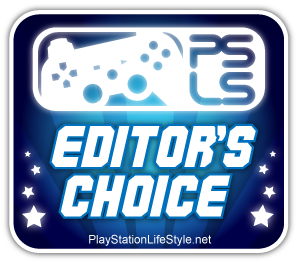 The first game was content at providing a tough boss and modifiers, while this one seeks to tell 22 mini-stories, filled with side-quests and other adventures. Often it’s just as likely that undertaking a side task, like attempting to rescue a family from a burning building, will lead to failure as it is the main campaign to overcome you. The more I played Hand of Fate 2, the more I was amazed by the divergence from the formulas of the original. Defiant tries out some unique things with the card layouts and campaign modifiers. Instead of simply navigating a maze of randomly placed encounters, you might find yourself trekking through a city where the layout of the cards is unknown. Only moving to a card will reveal those adjacent to it. One encounter even filled the entire board with desert cards where failure meant I was left to wander the sands, slowly starving to death. As much as the deck is stacked against me, Defiant offers many more ways to offset the chance of failing and customize the experience. 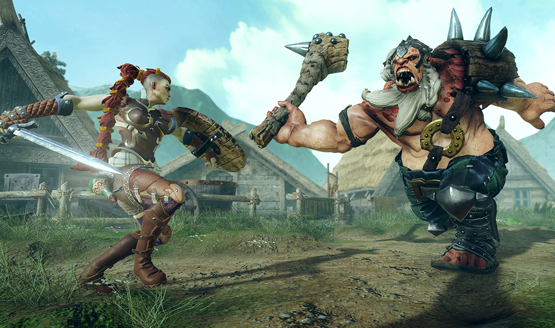 Companions will now aid you in battle, and come with special abilities both in combat and out. In combat, one might provide a shield, where another charges and stuns groups of enemies. Back on the card table, one may offer another spin at the card wheel while another may hand over an extra die to using during the dice gambits. Being able to tailor each campaign to be the experience I wanted it to be gave me a renewed sense of potential and success each time I would undertake a new trial. The companions even have their own encounter cards that offer a series of sidequests relating just to them. What would the sequel to the ultimate game of chance be without some new ways to lose? The Dealer isn’t just playing with shuffling cards anymore. There are new chance games to fail at mastering, including rolls of the dice, a spinning wheel of cards, and a pendulum game where you must stop a swinging pendulum on a very small (and also moving) success platform, or risk failure. Failing gets exhausting when it’s the same four card monty time and again, so it was nice to get the chance to fail in a variety of other ways. I was still losing, I was just having more fun doing it. Combat is much smoother than it was in the first game and really takes away the desire I had to constantly blame death on the very stiff battle mechanics. In the first game, it was all too common to reach the final boss of a campaign and lose strictly on technical hiccups, but Hand of Fate 2 gives even the most unlucky of players the chance to succeed in battle. One campaign scenario even starts out in a troll’s cave after losing most of your health, and there’s no way to regenerate it. I fought multiple combat encounters before reaching the safety of the town, essentially having to complete them all perfectly. If that’s not Defiant’s confidence in their newly refined battle system, then I don’t know what is. If I fall in combat, I have nothing but my own skills to blame, a rarity in a game where everything is determined by fate. There are still some bumpy spots, mostly in audio hiccups (the Dealer’s voice sounded slightly warbly to me for my entire game, like it was partially underwater or getting an audio subtle reverb, and there were occasional “pops” in the audio) and graphical hitching during loading. Load times are much faster this time around though and many of the unnecessary junctures, such as going to shops, have been streamlined into the gameplay to make the road to failure in each campaign much faster. It’s much easier to reconcile a death when the game doesn’t seem to be actively working against you on a technical level. When failure comes as often as it does in Hand of Fate 2, you can safely be frustrated at the fates, not at the game’s technical issues. Defiant Development is a Dungeon Master getting better at their craft, taking us through a series of campaign filled with new mysteries, twists, turns, and mechanics. Not content with jut polishing up the formula of the original game, Hand of Fate 2 takes a step forward and defines what a sequel should be. Improvements abound, challenges await, and every single failure begets the promise of a bigger success, if you’d chance your fate in the cards. Hand of Fate 2 review code provided by publisher. Version 1.02 reviewed on Standard PS4. For more information on scoring, please read our Review Policy. Audio issues crept in too often.